An e-catalogue of 2018/2019 Publications is available here. Xabier Irujo is director of the Center for Basque Studies at the University of Nevada, Reno, where he is professor of genocide studies. Member of the editorial board of four academic presses, he has authored more than 15 books and has received awards at national and international levels. His recent books include Gernika 1937: The Market Day Massacre (Nevada UP, 2015), The Bombing of Gernika (Center for Basque Studies Press, Reno, 2018) and Legal History of the Basque Language (HAEE, Bilbao, 2015). On April 26, 1937, a weekly market day, nearly sixty bombers and fighters attacked Gernika. They dropped between 31 and 46 tons of explosive and incendiary bombs on the city center. The desolation was absolute: 85 percent of the buildings in the town were totally destroyed; more than 2,000 people died in an urban area of less than one square kilometer. Lying is inherent to crime. The bombing of Gernika is associated to one of the most outstanding lies of twentieth-century history. Just hours after the destruction of the Basque town, General Franco ordered to attribute authorship of the atrocity to the “Reds” and that remained the official truth until his death in 1975. Today no one denies that Gernika was bombed. However, the initial regime denial gave way to reductionism, namely, the attempt to minimize the scope of what took place, calling into question that it was an episode of terror bombing, questioning Franco’s and his generals’ responsibility, diminishing the magnitude of the means employed to destroy Gernika and lessening the death toll. Even today, in the view of several authors the tragedy of Gernika is little less than an overstated myth broadcasted by Picasso. This vision of the facts feeds on the dense network of falsehoods woven for forty years of dictatorship and the “one only truth” of El Caudillo. Xabier Irujo exposes this labyrinth of falsehoods and leads us through a genealogy of lies to their origin, metamorphosis and current expressions. 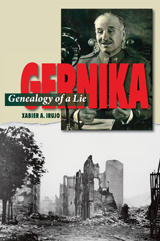 Gernika was a key event of contemporary European history; its “alternative facts” historiography an exemplar for commentators and historians faced with disentangling contested viewpoints on current military and political conflicts, and too often war crimes and genocide that result. For more information on this title click here.